No matter which space you occupy in digital marketing, chances are July brought on some kind of change or upgrade to the way you work. Whether it’s Google making their URL inspection tool open to everyone for use, or Facebook improving the ad creation process on our mobile phones. That’s not all, either, because Pinterest are stepping up their game with UX improvements and Instagram revealed another way to get interactive in the Stories feature..
After soft launching the product two weeks prior, Google officially shared their URL inspection tool with everyone using Search Console this past month. In a nutshell, the tool shows you the status of how the search engine views each URL on your website. By using the tool, Google says you’ll see the “detailed crawl, index, and serving information about your pages, directly from the Google index.” As part of those details, you’ll see bits like the previous crawl date and the status of that crawl in addition to any errors with AMP, structured data and indexing. If you’d like to know more about how exactly this all works, check out Google’s guide to the URL inspection tool. 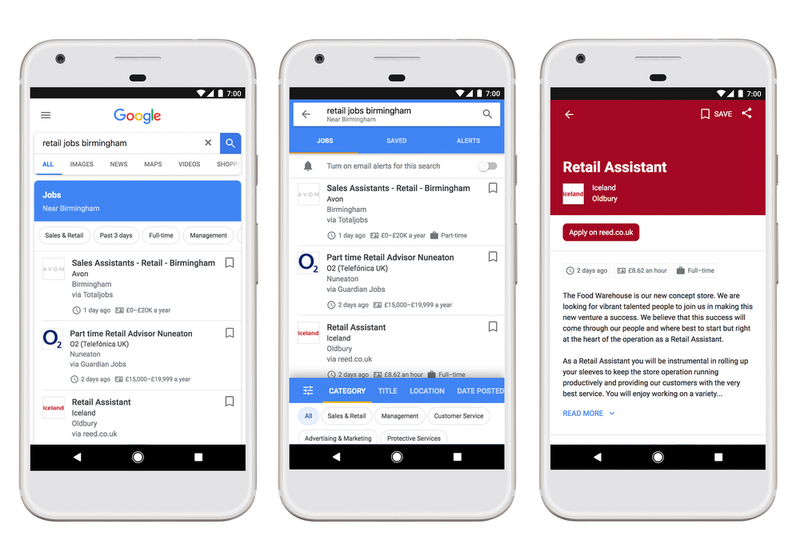 Google have brought their improved Jobs search feature to the U.K. after launching it in the U.S. last year. It streamlines the process of looking for a new gig by putting everything in a single place. Now, when you search “jobs near me,” “writing jobs” or something similar in English, you’ll see a bunch of relevant job opportunities that you can then click through and sort however you see fit. With this new function, you can save jobs that you’re interested in applying for, view information related to salary and specifications, and even filter by location, which can then estimate your potential new commute. So far, Google have teamed up with a number of leading job listing sites and companies, including The Guardian Jobs, Gumtree and CV-Library, to bring users a comprehensive rundown of what’s available. Have you tried out this new search feature yet? Google’s plans to make their Chrome browser as secure as possible hit another level on 24 July when they began notifying all users that certain websites (read: non-HTTPS sites) are “not secure.” This change started rolling out in September 2016 and has since reached widespread adoption as a means of helping users know when they’re entering private information—log-in credentials, credit card details, etc.—into a form on a non-encrypted, HTTP site. The goal, of course, is to make users feel more secure and safe whenever they’re ordering a new item, making travel accommodations, or performing any action that requires private info. And even though the “not secure” notification on HTTP sites is now universal, Google aren’t done here just yet. In October of this year, for example, that same notification will appear as more noticeable red text. If you’re a webmaster looking to make your site more secure by moving to HTTPS, check out Google’s post on their Chrome security update. U.S. publishers (who are eligible) have a new way to connect with their readers and it may sound familiar if you have been following search trends this past year or so. Of course, we’re talking about a connection to voice search, which publishers can take advantage of through using Google’s still very new “speakable” schema markup. The way it works is simple (and the following is taken directly from the company): Ask your Google Assistant a question like, “Hey Google, what’s the news on NASA?” and the device reads you back an excerpt from a recent news story in addition to the publication’s name. The user can then opt to hear more related stories and even have their URLs sent to their smartphone. As noted, this is only happening with specific U.S. publishers right now, so head over to Google’s eligibility page to learn more if you’re interested. We’ll keep you updated when and if speakable expands to other countries. You can download the Ads Manager app and learn more about the new updates here. In addition to expanding their Ads Manager app, Facebook announced three new ways for digital marketers to reach consumers through advertising on the platform. For the first update, they’re testing out how to blend augmented reality with ads. In this scenario, users could click on a beauty brand’s ad to see how their latest line of lipstick looks on them, all by using their smartphone camera. This feature is currently being tested by a select group of companies, but Facebook plans to broaden it as the year progresses. They’re also encouraging advertisers to experiment more with mobile-first video creation by launching the Video Creation Kit in August. The tool will allow marketers to build videos through uploading images and then adding overlays and logos, and it will be available on Facebook, Instagram, Messenger and Audience Network. Finally, Facebook are expanding the way marketers can reach Instagram users. Brands that enable the “Shopping on Instagram” function can now showcase their products by using stickers within the Stories function. Additionally, Instagram now allows brands to use the “collection” ad format, which lets users browse multiple products without leaving the app. We’ll let you know if Facebook have any more ad changes in the works as we get closer and closer to the holiday season—it’ll be here before you know it! In case the sweltering heat, shorts and flip-flops didn’t tip you off, we’re right in the middle of summer. And in these warmer months, Pinterest has found some fitting trends based on the way its users are pinning different items, ideas and concepts on the platform. Some of the bigger trends include a growing interest in graphic towels and tassel towels, in addition to an absolute surge in people saving micro sunglasses and woven handbags. They’re also seeing spikes in woodworking and gardening projects. If you’re advertising on Pinterest, you know what this all means: embrace the season and match your content to what users are clearly interested in. Pinterest also says that ads should provide a real-life context so that users can get a better idea of what your product or service really looks like. As of 11th July, Pinterest made it a whole lot easier for users to collaborate on group boards by implementing an activity feed. In addition to showing the latest updates within the board, the feed allows users to communicate with each other. Want to tell someone that you like their idea for an upcoming event? Well, now you can do that with a simple ‘Like’ or explain that they could add, say, another cocktail to the mix to provide even more tasty beverages to the party menu. And for privacy’s sake, these comments and discussions are only visible to those taking part in the group board, so no worries there. If you want to know more or simply want to get started with your own group board, head over to Pinterest. Instagram added another way for users to interact with each other within the Stories feature by releasing the new question sticker. Much like the emoji poll sticker that arrived in May, the question sticker can be placed on any photo or video you upload as part of a story. All you have to do is type up a question and wait for the replies to start rolling in. Essentially, this allows users and brands alike to engage in more fun and interactive Q&A sessions with their followers. This way, you can easily get feedback on anything you’re willing to share, whether it’s a video or photo of a new product, an idea for a new event, or whatever else. Have you started using the questions sticker yet? Just make sure your Instagram app is updated to version 52 and you can get started.